Hair Washing Tray for Sink For Wheelchair Users. You are here: Around The Home > Bathroom & Toilet > Hair Washing > BA-7170. 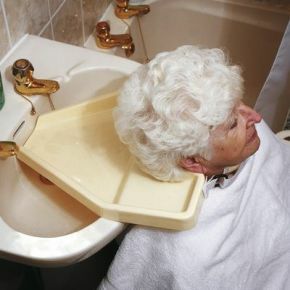 Hair washing tray for wheelchair user. A plastic tray, shaped to fit behind neck and attached with a Velcro strap. Enables hair to be washed by a helper over a sink or bath without spillage. I am a mobile hairdresser and have elderly clients who I use this with and saves them a lot of neck ache! perfect for their needs.